Very easy to install with clear instructions. Costs less than Maytag without compromising quality or flow rate. Tastes great by leaving potentially beneficial minerals while removing chlorine, other chemicals and contaminants. The quality of the filter is the same as the branded filter but costs less. The actual filter in the unit was made in the US and is an excellent filter that you can feel confident will match up to the Maytag brand without paying their high prices. This refrigerator water filter features a PUR® Water Filtration System and can be used in bottom-mount refrigerators with filter access inside the refrigerator. Simply turn the filter to remove and replace. 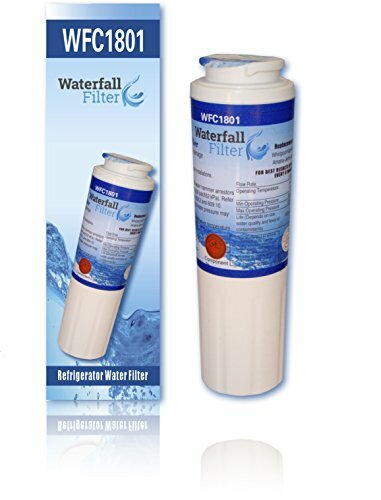 While retaining beneficial fluoride, this filter is NSF® Certified to remove/reduce chlorine taste & odor, particulates, lead, mercury, cysts and 13 additional contaminants. The contaminants or other substances removed or reduced by this water filter are not necessarily in all users’ water. For freshest water and optimal performance, replace water filter every 6 months.